The honorees of the 2016 CSUN Volunteer Service Awards on Nov. 18 in Woodland Hills. Sally Magaram accepts the CSUN For Life Award at the 2016 CSUN Volunteer Service Awards on Nov. 18 in Woodland Hills. Daniel Blake accepts the Dean Ed Peckham Award at the 2016 CSUN Volunteer Service Awards on Nov. 18 in Woodland Hills. 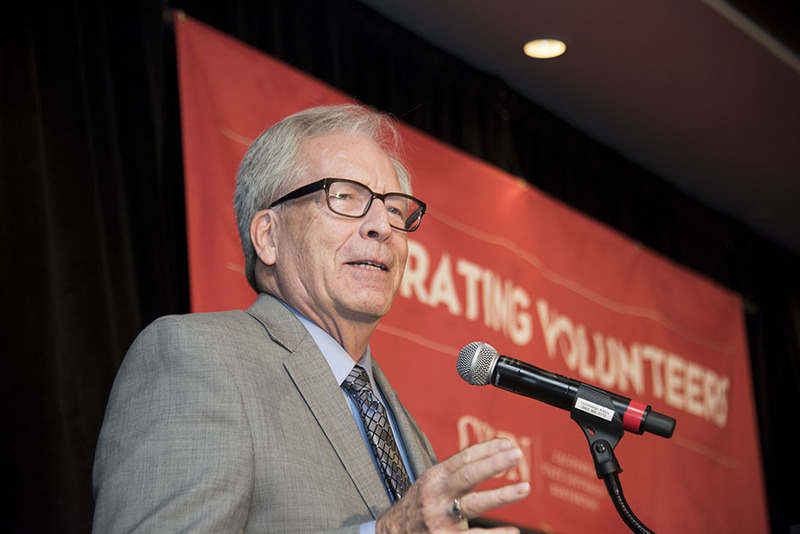 Phil Mundy accepts the Dorothea "Granny" Heitz Award at the 2016 CSUN Volunteer Service Awards on Nov. 18 in Woodland Hills. Every year, thousands of alumni and friends give back to CSUN and its nearly 40,000 students. The 15th annual CSUN Volunteer Service Awards luncheon honored 27 of these selfless individuals during a Nov. 18 celebration at the Hilton Woodland Hills. These devoted volunteers have shown their affinity for CSUN by advocating for the university, by helping students and alumni find career success, and by donating funds to support the university. 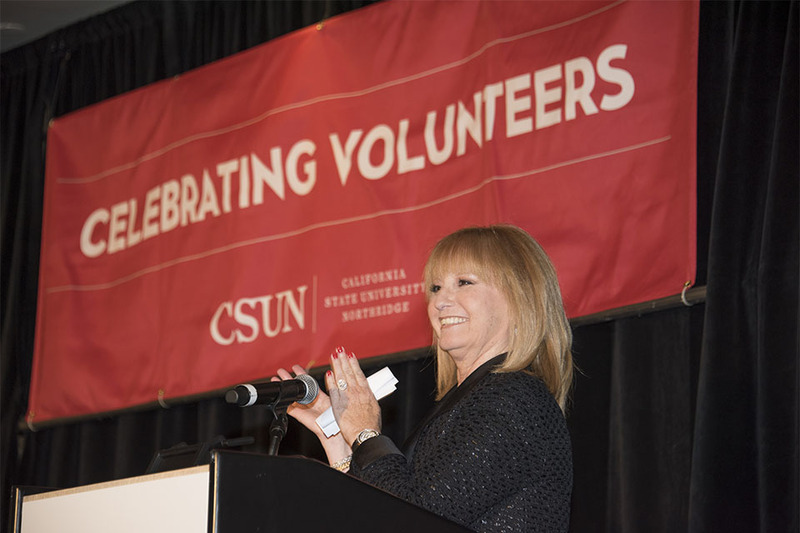 “We are here to recognize the volunteer trailblazers who help elevate CSUN and our impact through advocacy, mentoring our students, attending athletic and cultural events on campus, supporting CSUN, and so many other vital ways,” said CSUN President Dianne F. Harrison. 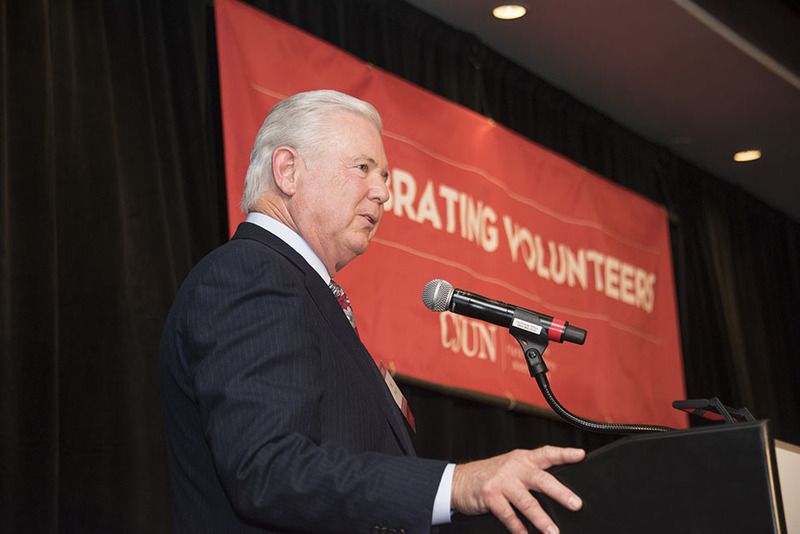 The university presented Volunteer Service Awards to volunteers from CSUN’s 12 alumni chapters, as well as supporters of its colleges and programs. The day’s highest honors went to Phil Mundy ’71 (Business Administration), Sally Magaram and Daniel Blake. Mundy received the Dorothea “Granny” Heitz Award for Outstanding Volunteer Leadership, Magaram received the CSUN For Life Award and Blake was given the Dean Ed Peckham Award. The Dorothea “Granny” Heitz Award is the pinnacle Volunteer Service Award and recognizes significant and sustained leadership by a CSUN alumnus. The award is named in honor of Heitz, whose enthusiasm and loyalty to the university spanned decades. Mundy, an entrepreneur who is in his third three-year term on the CSUN Foundation Board as chair of the development committee, was overwhelmed by the honor. The CSUN For Life Award is given to non-alumni friends of CSUN who, over time, have grown close to the university and proudly claim CSUN as their adopted alma mater. Magaram has made an impact at CSUN by supporting her husband Phil and the Marilyn Magaram Center, which celebrated its 25th anniversary in September, and the Valley Performing Arts Center. She co-chaired its opening gala on Jan. 29, 2011. “I only do things because things are so meaningful to me,” Magaram said. “I want to help people. I want to help places. We have the jewel of VPAC here. But you know what? CSUN is a jewel in itself. The Dean Ed Peckham Award, named for the former dean of students and vice president of Student Affairs, goes to an emeritus/emerita or retired member of the faculty or staff who is loyal to and supportive of the university. Blake, an influential former professor and leader in the David Nazarian College of Business and Economics, acknowledged his former colleague when receiving his honor. “I’m very honored to be in the company of Ed Peckham and all the recipients who have gone before me,” Blake said. “It’s a great group. And the other thing that’s great is Cal State Northridge. I was lucky to come here in the early days. There were so many opportunities on campus, so many things to be developed, so many ways to serve — not only the students, but the community. And I’ve had the pleasure of engaging in some of those ways.